Hello Stampers! 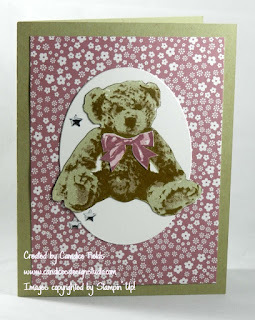 Today, I am featuring the new Baby Bear stamp set. This set is all about photo realism. When I first saw this stamp set, I just waited to pick up and hug the bear. For my first card, I was inspired by another card I found on Pinterest. I used the Perpetual Calendar stamp set to create the hearts in the background. The color combination I used for this bear is Crumb Cake, Soft Suede, and Early Espresso; along with Mint Macaroon for the bow and card base. The second card was inspired by a sketch I found on Pinterest. This time I incorporated Sweet Sugarplum on the bow. The color combination for the bear is Sahara Sand, Crumb Cake, and Soft Suede. I added some of the new metallic enamel shapes for some added embellishment. I just love how these bears turned out!